Celiac disease is an autoimmune disorder in which the body is unable to digest gluten, a protein found in wheat, barley and rye. The only treatment for the condition, which affects nearly two million people in the United States, is a strict gluten-free diet. For those managing celiac, the pain and discomfort from ingesting even the smallest amounts of gluten, like crumbs from a cutting board or toaster, can damage the small intestine. The Celiac Disease Foundation is an education, research and patient advocacy champion. Founded in 1990, the nonprofit organization led efforts to develop the celiac disease blood test and the U.S Food and Drug Administration’s (FDA’s) gluten-free labeling rule. The Foundation also funds research at major academic medical centers like Stanford, University of Southern California, UCLA, Columbia, Harvard, University of Chicago and Children’s National Health System. “What we advocate for, what we fight for, what we work for, above everything else, is to improve disease diagnosis, and to bring to patients FDA-approved treatments and a cure for celiac disease,” said Marilyn G. Geller, the Foundation’s chief executive officer, during the 2018 Celiac Disease Foundation National Conference. Gluten-Free Living (GFL) magazine and the Celiac Disease Foundation have a shared vision: to promote the advancement of celiac disease research and spotlight celiac and gluten-free champions in our community. With this vision in mind, GFL is proud to announce Geller as the newest member of our advisory board. In this one-on-one interview, Geller discusses the Foundation’s history, research and outreach goals, and the importance of partnering with GFL. GFL: How did you become involved with the Celiac Disease Foundation? Geller: For 14 years, my son, Henry, suffered from debilitating symptoms despite seeking help from countless health professionals. [He suffered from] intense stomach pain, headache and depression. A chance blood draw finally revealed that celiac disease was the cause of his suffering. After he was diagnosed and went on the gluten-free diet, his body and mind began to recover quickly. 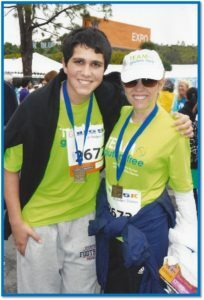 I did not want other children or, for that matter, other parents and caregivers to go through what my family did, so we became active in celiac disease patient advocacy by volunteering and fundraising for the Celiac Disease Foundation. I saw the need for improved diagnostics, improved patient and health-care provider education, and more research into the disease and its progression. I joined the Foundation board of directors, and in 2012 became chief executive officer. GFL: Why is it important for the Celiac Disease Foundation to partner with Gluten-Free Living magazine? Geller: There are more than two million Americans suffering from celiac disease who remain undiagnosed. Two million… That’s more undiagnosed celiac disease patients than the total number of patients with inflammatory bowel diseases, Crohn’s disease and ulcerative colitis. These people suffer from more than 200 known symptoms, miss work, school, family engagements, birthday parties and more. Researchers estimate the prevalence of celiac disease will double in this population every 15 years. A significant part of our agenda is public and health-care provider education and awareness. GFL reaches deep into both of these audiences. There are numerous misconceptions about the utility and necessity of the gluten-free diet for individuals with celiac disease and non-celiac gluten sensitivity. GFL has emerged as a leading authoritative voice on this issue, and we are delighted to be associated with the publication. GFL: What is the Celiac Disease Foundation’s Symptoms Checklist and how has the online tool evolved? Geller: In 2014, we launched the online Symptoms Checklist, an easy-to-use tool to help individuals who are concerned they might have celiac disease ask the right questions of themselves, and of their health-care providers, to assess the likelihood of the disease. To date, more than two million people have accessed the tool, hopefully increasing diagnostic rates. Thanks to a grant from a generous donor, we are currently transforming the Symptoms Checklist into a Symptoms Assessment Tool, which will inform health-care providers if their patients should undergo genetic or serology (blood) screening for celiac disease. We expect to launch this in the coming months. GFL: What is the iCureCeliac® patient registry and how is it driving the search for a cure? Geller: iCureCeliac® is a secure online patient registry funded through a grant from the Patient Centered Outcomes Research Institute (PCORI). Under informed consent, participants fill out surveys about their medical history and experiences living with or caring for someone with celiac disease. The Celiac Disease Foundation then provides vetted researchers with the anonymized data in iCureCeliac®. Researchers may also identify a subject profile, the type of patient they wish to study. The Foundation invites patients who fit the subject profile to participate in clinical trials, research studies and focus groups. By creating this readily available pool of data and patients, the Foundation is able to significantly accelerate the research process. GFL: What research-driven accomplishments do you hope to achieve over the next five to 10 years? Geller: Forty-four percent of our community report experiencing ongoing complications of celiac disease, despite strict adherence to the gluten-free diet. Thirty-seven percent of our community report celiac disease comorbidities, especially with other autoimmune disorders. Our most urgent focus is supporting research for celiac disease diagnosis, treatments and a cure. Our initiatives include recruitment for research studies and clinical trials through our iCureCeliac® patient registry, direct funding of biomedical research at some of the nation’s leading academic medical research centers, and a major patient engagement initiative to help foster understanding among patients, researchers, policymakers, and health-care providers about celiac disease and the many challenges it presents. GFL: How can people get involved with the Celiac Disease Foundation? Geller: My first recommendation is to visit celiac.org. There you can find everything we know about celiac disease and non-celiac gluten sensitivity, including our Symptoms Checklist to help assess if you have celiac disease. If you have celiac disease and want to help, I encourage readers to pay particular attention to two initiatives: the first is iCureCeliac®, our patient registry. This is our game-changer to accelerate the discovery of treatments and a cure. The second is our Ways to Give page. We rely on the generosity of individual donors and our Team Gluten-Free and Student Ambassador fundraisers to make our work possible, and there are many ways to help. Maureen McCarthy is the editorial director of Gluten-Free Living. Looking for more information on the sources of reliable information available to those living with celiac and other gluten-related disorders? Check out our Resources and Support section!